The PawSox got one back in the bottom of the fifth, then took the lead in a crazy sixth inning. With one out, Bryce Brentz and Garin Cecchini had back-to-back singles, chasing Stroman. However the Bisons got no relief, as his successor uncorked a pair of wild pitches. On the second of the two, as Brentz raced home, a throwing error by the Buffalo catcher allowed Cecchini to score as well, giving Pawtucket a 4-3 lead that it would not relinquish. Tommy Layne earned the win in relief, firing two hitless innings and striking out two. Chris Hernandez, who had been working in the rotation, threw 2/3 of an inning. His move to the pen may signal that Matt Barnes is ready to return from the disabled list. Alex Wilson picked up his first save of the year, striking out one in a perfect 1 1/3 innings. Henry Owens improved to 3-0 as Portland knocked off the Binghamton Mets (NYM), 7-4 to extend its winning streak to five games. Owens got into some trouble in the first after a leadoff walk was followed by a base hit. He escaped that trouble quickly when Sean Coyle grabbed a grounder, stepped on the third base bag, and fired the ball to second. Mookie Betts took the feed cleanly and relayed to Travis Shaw to complete the rare around-the-horn triple play (Betts and Shaw pictured above). That was all of the boost Owens needed, as the lefty did not allow another hit until the fifth inning. The Mets did finally reach Owens for three runs in the sixth, but that was only enough to bring them within two. Overall, Owens allowed three runs (two earned) on four hits in six innings. He struck out three and walked four. Noe Ramirez pitched two innings out of the bullpen, giving up a run, striking out four and wallowing one walk. Miguel Celestino struck out one in a perfect ninth to earn the save. The offense was once again led by Betts. Despite going 2 for 5 with a double, Betts' batting average fell five points, an indication of how outstanding the second baseman has been on the young season. Somewhat overshadowed by the play of Betts' has been the fantastic play of catcher Blake Swihart. A 2-for-4 night with a double and run scored raised his season line to .362/.375/.532 and extended his hitting streak to seven games. 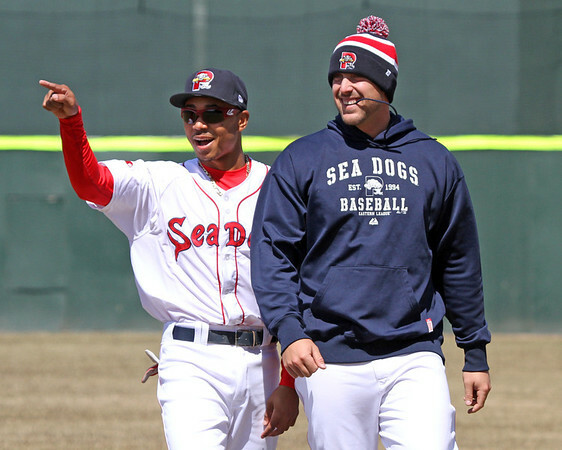 Shaw and Shannon Wilkerson both homered as part of the Sea Dogs attack. A combined three-hitter by Luis Diaz and Simon Mercedes allowed Salem to cruise to a 7-1 win over the Winston-Salem Dash (CWS). Diaz gave up the one run on three hits in six innings of work, striking out one without walking a batter. Diaz moved to 2-1 on the season and his ERA stands at 1.00 after the effort. Mercedes was sparkling in relief, striking out three in his three perfect innings. Josh Norris of Baseball America was in attendance, and he reported Mercedes was throwing 95-97 in his first inning of work and settling in at 92-94 with a mid-80's slider. A balanced offensive attack was led by a Carson Blair solo home run in the first inning. Matty Johnson and Mario Martinez picked up a pair of hits apiece, and Jonathan Roof delivered his eighth double of the season to tie teammate Kevin Heller for the Carolina League lead. Greenville finished off the affiliate sweep with an 8-3 win over the Asheville Tourists (COL). Cody Kukuk was solid for the Drive, giving up only one run on five hits in five innings while striking out seven and walking one to earn the win. Joe Gunkel gave up a two-run homer but also struck out five without issuing a walk in his two innings of relief work. Jonathan Aro struck out three and walked one in two hitless innings. Wendell Rijo hit a second-inning home run to lead the way for Greenville, his second of the year. Carlos Asuaje had a double and triple to extend his hitting streak to nine games. During that streak, Asuaje is 14 for 32, good for a .438 average. Manuel Margot drove in a pair as part of a 2-for-4 performance, and Jantzen Witte also had two hits for the Drive. Player of the Day: It seems almost unfair for Mookie Betts to keep getting honored, but it seems like each day he does something new. His peformance at the plate on Monday, going 2 for 5 with a double, has become almost expected of the second baseman. Betts, however, made his presence felt in the field as he turned the pivot on a 5-4-3 first-inning triple play.